In this guide you can find information on how to connect to an IP camera and record a video with a given picture size. To implement this example, you need to have OZEKI Camera SDK installed, and a reference to OzekiSDK.dll should be added to your Visual Studio project. How to set the picture size for video recording of an IP camera device using C#? 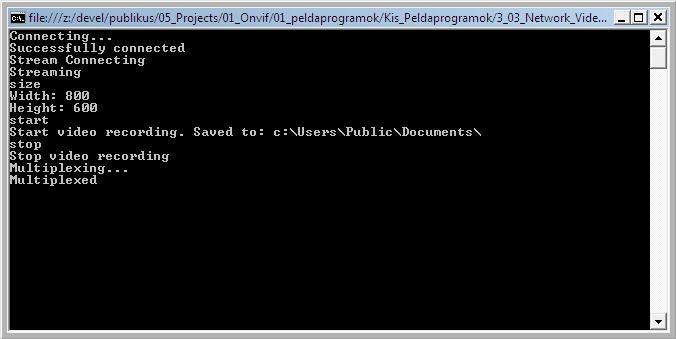 To establish the connection properly between your application and an IP camera you should apply the same code snippet what you have used in the example (How to connect to an IP camera device using C#?). Important: you should study this article in order to find out how to setup your Console Application correctly. With the ReadComand() method you can read three commands: size, start, stop. Size: You can set the resolution of the video. The default width is 1024 and the default height is 768. Stop: Stop the video recording. With the VideoResizer class your application will be able to change the resolution of the recorded video. videoResizer.SetResolution(width, height); method will set the resolution with the given width and height. In this method you create a list which contains supported video formats and set the format that the current list element have to use. After these you connect the camera's videochannel to the videoResizer and then connect videoResizer to the _mpeg4Recorder. This was you achieved that we record the video with the given resolution.